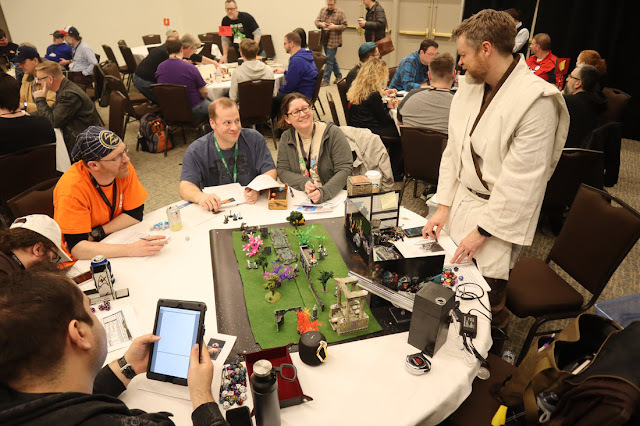 I got to run my "The Last Jedi" replacement Star Wars Saga adventure called NO LAST JEDI at GaryCon last week. I've finally recovered from the Con Crud, so can now do a recap of how it went. First of all, in case anyone wants to run a game of SW Saga themselves using the new movie's characters, I've uploaded pdfs of the character sheets I made for the game under the Campaign Resources of the Vorpal Chainsword. Second, I uploaded a bunch more pictures from the game people were nice enough to send me under the Gallery section of the site. The story starts out with essentially the same opening crawl as The Last Jedi. Only in this case Rey has been training with the enigmatic Luke Skywalker for about 3 weeks, but has learned little of his motivations. The game opens with Chewy returning from the Resistance fleet in the Millenium Falcoln with Fin, Poe, and BB-8 in tow (Poe came in on his X-wing). They were sent by order of Princess Leia to plead with Luke to return to the fight with the resistance. The players attempted to convince Luke of the nobility of the cause, but he kept insisting it was too dangerous for everyone if he left. At that point, BB-8 played a holographic message from Princess Leia for him. "Luke, I beg you to return from exile and rejoin our fight for the resistance. We have lost much since you left, the New Republic all having been wiped out by Starkiller Base before we were able to destroy it. But we have hope yet, as we have learned the secret location of the leader of the First Order, this Lord Snoke. We believe that if we can capture or kill Snoke the First Order will fall and Ben may even return to us. But I know that Snoke is strong in the Dark Side of the Force, and only with your help could we ever hope to prevail, but press on we must. The last remaining ships of the Resistance fleet are amassing for the final assault on his secret headquarters even as I record this message. This BB unit has the coordinates where to meet us. Help us Luke Skywalker, you're our only hope." BB-8 revealed that the location is in the Horuset system. At this Luke paled and says "We must stop her!" 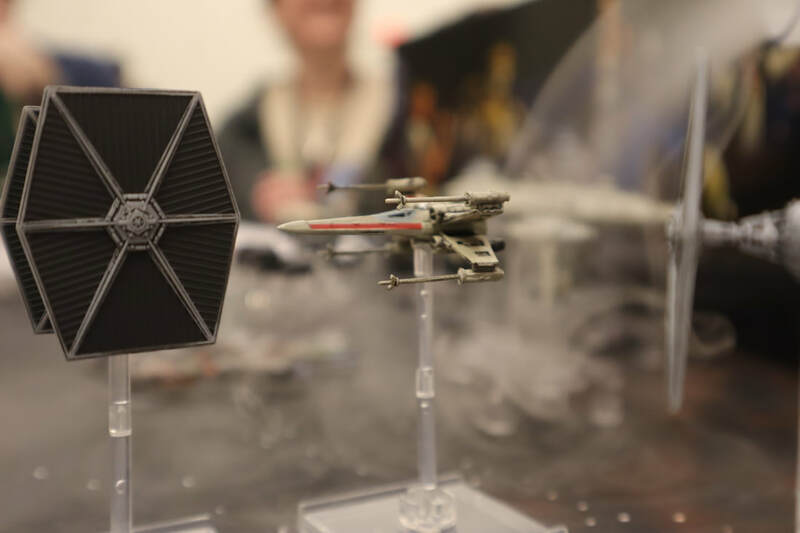 Just at that moment the sound of a Tie Fighter roared overhead! The Imperials had tracked the heroes to the old Jedi planet (the official name is Ach-To, fyi). The Imperials were now searching the planet for Luke. Now Luke has no choice but to go, so they've got to get back to the Millennium Falcon and Poe's X-Wing, and of course Phasma and a squad of Stormtroopers stand in their way. They fought their way past Phasma and her stormtroopers. Luke ran off to handle some AT-STs on the other side of the battlefield (if they'd convinced Luke earlier then instead he'd have stayed and helped and BB-8 could've controlled him). One unexpected hilarious moment of the game was that BB-8's player decided to roll around between bushes and ask if there were Porg nest under there. When he found some, he'd shock the Porgs to cause a burst of Porgs out of the bushes, startling nearby Stormtroopers, including Phasma! He even rolled so well on this that a hunting Nexu burst out of the plants intent on eating the Porgs and the Stormtroopers along with them. So the heroes were able to slip by Phasma (who was fighting off the Nexu) and blast their way clear to the Falcon. 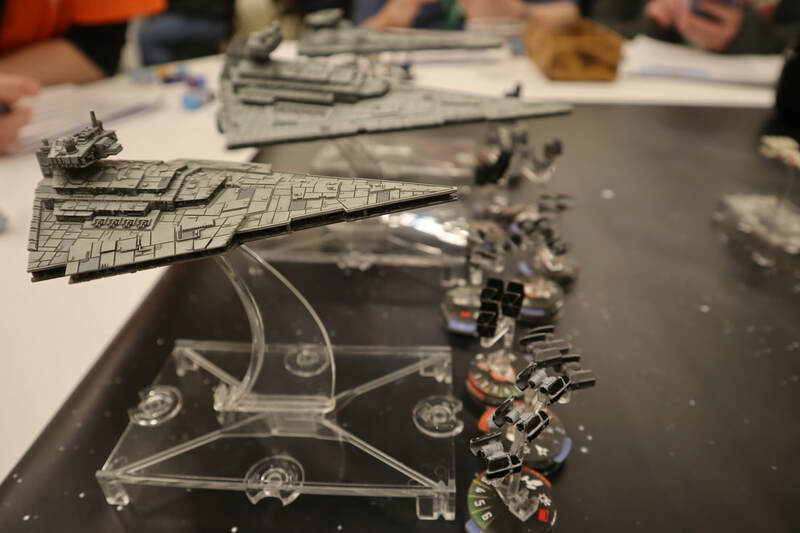 Next we had a Starfighter chase scene, where the Falcon and Poe's X-wing were harrassed by Tie Fighters as they tried to break through the blockade surrounding the old Jedi planet. (I used the X-Wing miniatures for this, as they just look awesome.) Finn and Rey acted as gunners in the Falcoln while Chewy flew, and Poe and BB-8 fought off Ties in the X-Wing. Luke just meditated mysteriously in the X-Wing. They escaped the blockade and made their way to the Resistance fleet. Here Leia and Luke embraced and Luke explained the plot. Long story short is that Luke actually found Snoke over 5 years ago while he was mopping up Empire remnants and old Sith artifacts with his crew of freshly-trained Padawans (including Ben Solo). They had found some holocrons mapping out some of Palpatine's other projects and were shutting them down before they became a problem for the New Republic. 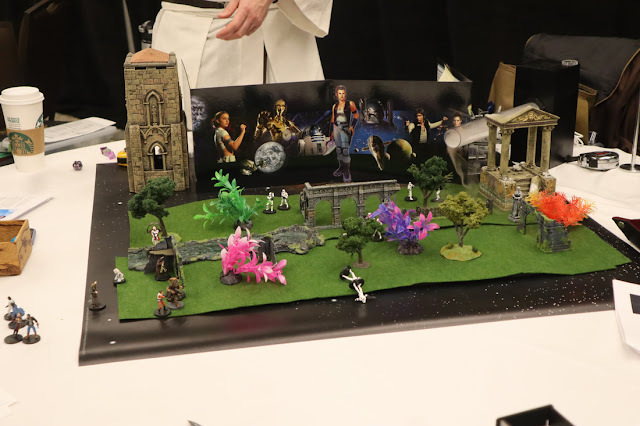 Unfortunately one of those projects was the Tomb of Darth Plagueis, Palpatine's old master. Palpatine couldn't kill Plagueis because Plagueis could jump bodies, and had done so many times before to remain immortal. Plagueis would jump into his Sith Apprentice after he was fully trained but before the Apprentice got wise to him, thus allowing Plagueis to live forever. But Palpatine figured it out, and froze Plagueis in a Force Trap deep within a Sith Tomb on Korriban. This Tomb required Palpatine to occasionally visit and maintain the suspension so Plagueis wouldn't wake up. With Palpatine's death though, it was only a matter of time before Plagueis woke up. Luke learned of Plagueis and took his best Padawans to go shut Plagueis down for good. However Plagueis killed most of his Padawans before Luke could pull some Force magic and block Plagueis's ability to switch bodies within the Force. Ben and Luke then pulled the temple down on Plagueis and barely escaped with their lives. What Luke didn't know was that Plagueis had survived and already put his mark on Ben as his next apprentice, who was grieving from the loss of his friends and vulnerable to the Dark SIde. Eventually Ben turned evil and destroyed the New Jedi Temple, due to whisperings in the Force from Plaegus (also known as "Snoke"), and joined Snoke and helped build the First Order from an Empire remnant fleet. Luke finally explained that if he were to die, Snoke would regain his ability to switch bodies through the Force and would likely immediately take over Kyle Ren/Ben's body, which Kylo certainly wasn't aware of. So Luke had to stay in hiding to study the Jedi texts and figure out how to permanently sever Snoke's connection to the Force before he could take over Kylo Ren's body for good. But he's come out now because of where the Fleet discovered the hidden base, the Horuset system, which is where Korriban (and Plagueis's tomb) are! Luke knows Snoke's tomb is on the planet below them. The heroes knew Snoke was on the surface, and wanted to get Luke down there to kill him once and for all. They also knew they should probably stop the Hyperspace Jammer on the main Star Destroyer. AND the X-wings were getting killed out there so they wanted Poe to help in the overall Starship battle. So they decided to DO ALL THREE! Poe flew out on his X-wing with BB-8, and fought his way to the main Star Destroyer. He then JETTISONED BB-8 into one of the hanger bays of the Star Destroyer! Just, out in space and through the blue shield thing right into a hanger. By himself! Then Poe just flew back into the main battle. So BB-8s goal was to disable the Hyperspace Jammer alone. Hilarious. Luke, Rey, Chewy and Fin took the Falcon through the starship battle and down to the planet, evading and blasting Tie fighters along the way. Once there, they entered the Sith Tomb. 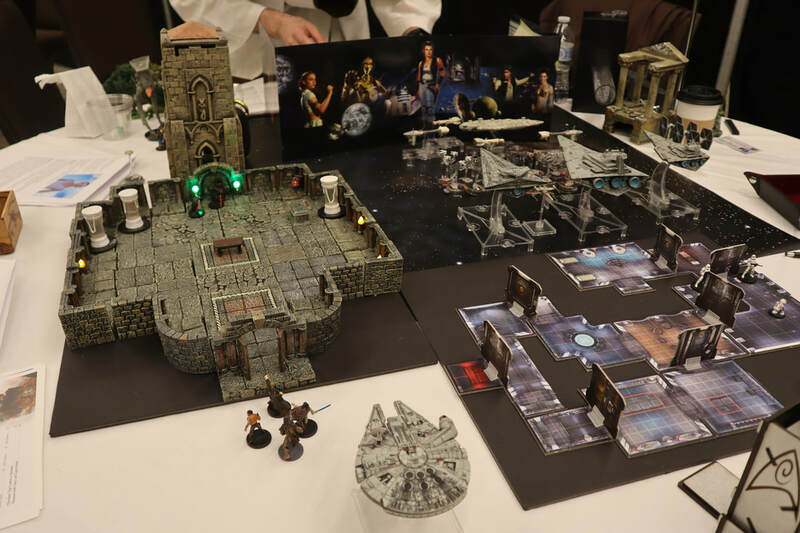 (Chewy used quite a few Force Points on the piloting checks going down, and I just let them find the tomb rather than fight their way up to it). So we had this three way encounter going on. Poe would blast a Tie or two. The ground heroes engaged Snoke and Kylo Ren and some Imperial Guards, and BB-8 had to bumble his way through the Star Destroyer. 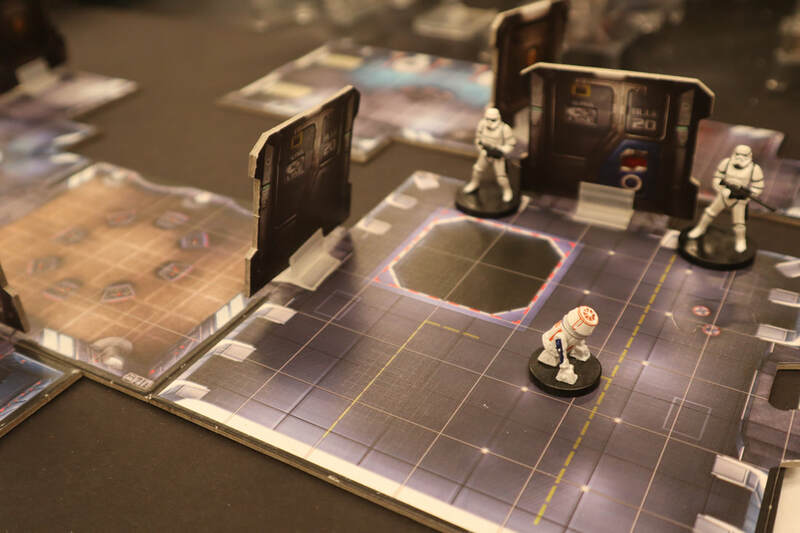 That was probably the most fun part of each turn, watching BB-8s player figure out how to trick a Stormtrooper into falling down a chute or electroshock him into tripping and falling. Eventually BB-8's player found a maintenance tunnel and was able to make his way to the Hyperspace Jammer (bypassing a TON of Stormtroopers I had ready to go) and disable it. He then shot himself out the garbage shute and into space. Poe had placed a tracker on him so just picked him up floating out in space mid-battle! It was pretty awesome. What a game! 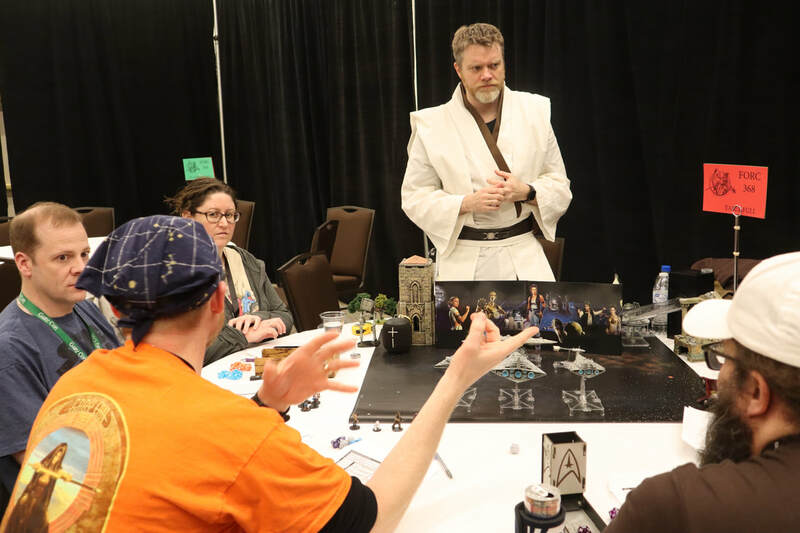 I have to say, it was so much fun, and the players at GaryCon were some of the best folks to help re-write The Last Jedi into a Star Wars story worthy of the Saga!